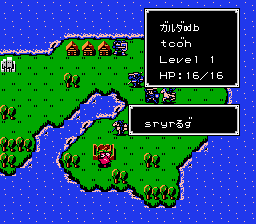 A turn-based strategy RPG, the first Fire Emblem game is widely considered to be a codifier of the genre. 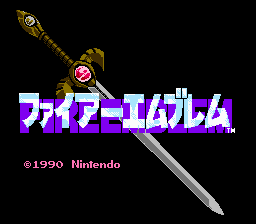 It features numerous characters that grow stronger as they defeat their enemies and many difficult challenges along the way for them to overcome. 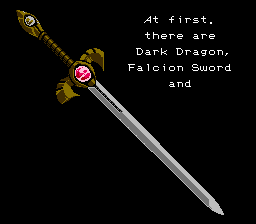 The game stars Prince Marth of Altea as he ventures across the continent, in some cases for liberation and in other cases for miscellaneous deeds, and as he quests to reclaim the titular Blade of Light (Falchion); the weapon of his ancestor Anri forged from the fang of a divine dragon, and stolen from his country by a traitorous former ally (the country of Gra). 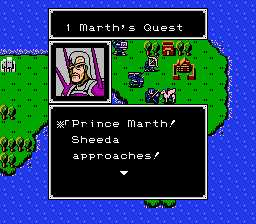 Eventually Marth fulfills his destiny to utilize it in order to slay the titular Shadow Dragon (Medeus), a powerful Earth Dragon and the emperor of Dolhr. This still has quite a ways to go, but hey - all the menu text and a goodly chunk of battle text is done, as well as all the dialogue text for Chapter 1 (of 25). Ooh, and the font is pretty spiffy, too. So yay. Dave’s told me that since his translator disappeared, he has no interest in finishing the game. Sorry kids.